Though I enjoyed this novel as much as the first, I also found it quite frustrating. Tris is supposed to be insightful, yet she spent the entire novel blind to who Tobias is, what he wants, and his feelings for her. These two love each other, but have trouble trusting one another. I guess because they’re teens dealing with grown-up issues, that it’s easy to forget they are just teenagers. This is the first time either has been in love, and raised like they were, have trouble expressing themselves. Many of the problems they had seemed to be created by this mistrust. This series is often compared to The Hunger Games, but aside from the dystopian society, I don’t find them similar. Yes, both books have a strong female protagonist. Yes, there is a complicated love story wrapped inside a political thriller. However, I don’t believe this series is headed in the same direction. While The Hunger Games series showed what happened when the lives of a societies children are offered up for sport, something about the Divergent series gives me flashbacks to M. Night Shyamalan’s film, The Village. 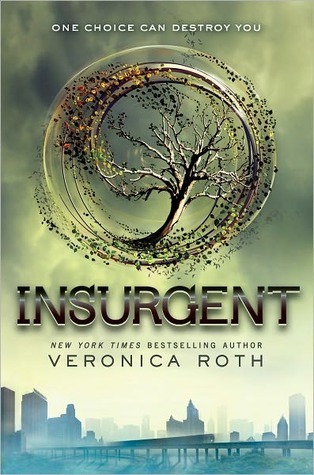 I have no idea what will happen in the third book, but events in Insurgent leave me with the feeling that Roth is about to pull the rug out from under us, and reveal that the residents of Tris’ Chicago aren’t the only ones in a “simulation.” We are.